The ancient beverage wine is the result of the fermentation of grape must. This n- urally and fairly stable product has been and is being used by many human societies as a common or enjoyable beverage, as an important means to improve the quality of drinking water in historical times, as therapeutical agent, and as a religious symbol. During the last centuries, wine has become an object of scientific interest. In this respect different periods may be observed. At first, simple observations were recorded, and subsequently, the chemical basis and the involvement of microorg- isms were elucidated. At a later stage, the scientific work led to the analysis of the many minor and trace compounds in wine, the detection and understanding of the biochemical reactions and processes, the diversity of microorganisms involved, and the range of their various activities. In recent years, the focus shifted to the genetic basis of the microorganisms and the molecular aspects of the cells, including metabolism, membrane transport, and regulation. These different stages of wine research were determined by the scientific methods that were known and available at the respective time. The recent "molecular" approach is based on the analysis of the genetic code and has led to significant results that were not even imaginable a few decades ago. 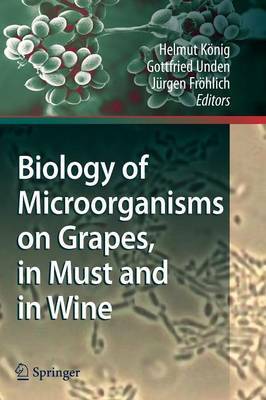 This new wealth of information is being presented in the Biology of Microorganisms on Grapes, in Must, and in Wine.